There are many types of field boundaries in Scotland, which range from simple ditches to mounds of earth to hedges to elegant stone walls. The general term in Scots for these boundaries is 'dyke'. The stone walls are a feature of the landscape in Scotland, and have sadly often tumbled into disrepair. 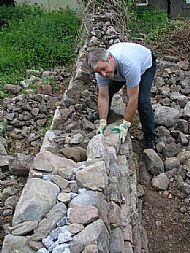 One reason for this is that the walls have been built without mortar (dry-stane), and their construction is a skilled affair, as can be seen in the photo. Happily there is currently a resurgence in interest to acquire the necessary skills.